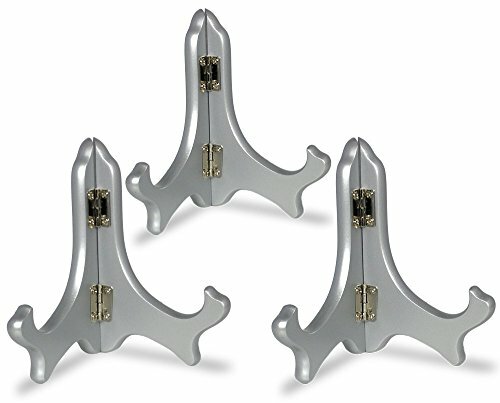 Set of 3, solidly constructed silver easels holds plates, trays, books, and other objects securely. Beautiful silver metallic finish on wood material to compliment any decor. Contoured edges and hinged to fold flat. Great for home or office. SILVER PICTURE HOLDER. SET of 3 Silver Metallic wood folding easels. Great addition to any wedding reception to hold name cards, photos, pictures, plaques with quotes or party favors. Use in your curio cabinet to hold small china and plates. Beautiful metallic silver color goes with any china pattern or plate design. PLATE DISPLAY STANDS. Use these mini easels to display small plates or saucers for you teacup collection. WOOD EASELS. DECORATIVE USES: holds collectible plates, trays, tiles, saucers, books and other objects. Place objects on your fireplace mantel, curio cabinet, table or shelf. Excellent accent for a wedding reception party or 25th anniversary. SMALL TABLE EASEL. Solid construction and sturdy. Contoured edges for an elegant, classy look. These are the perfect addition to any event or wedding ceremony. WEDDING TABLE TOP PLACE CARD HOLDERS. SIZE: 5" H. HINGED FOLDING: Fold flat for storage purposes.